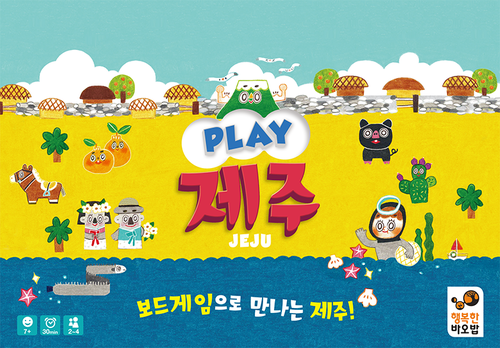 In Play Jeju, players are visitors to the Korean island of Jeju – as they visit the different locations on the island, they will see different beautiful things – such as cacti, ponies, black pigs or the Hallasan mountain – and they will collect tiles with these things depicted on them. Each player gets two player tokens of their color. All of the Jeju tiles are randomly placed on the six sites that encircle the isand. Each of these locations has a black neutral token placed on it, and then the players take turns placing their own colored tokens in locations. The Harubang token (big orange thing) is placed next to one of the sites by the last player to place their token. The VP cards are shuffled, and 5 are displayed face up next to the deck. On your turn, you must take one of two options – either travel and collect Jeju tiles OR take a VP card. To travel, you choose any site on the board and pick up the entire stack of tokens there. Of note, you must have at least one of your colored tokens in that stack – it does not matter where in the stack it is. Then, choosing to go either clockwise or counterclockwise, you move the stack in the chosen direction, and at each site that you come across, you drop off the bottom-most token from your stack onto the stack at the location you are passing thru. You continue to do this until you have dropped off all tokens onto new stacks. Now, all players who are on the top of a stack collect the topmost tile from that corresponding location. Note that this is all players… not just the one who triggered the movement. If a tile has no tokens, no one collects anything. If the location is out of tiles, then none are collected either. Furthermore, the player which is next to the Harubang statue may take the top tile at any location. The Harubang statue is moved to whichever location the tile was chosen from. If you choose not to travel, you may instead choose to score a VP card. Each of the VP cards has a pattern of tiles necessary to score it. You turn in tiles that match the pattern and keep the card. There are six basic types of tiles as well as a special yellow diver tile which is wild and can be used as any other tile. There is a VP value on the bottom of each card. Additionally, some of the cards have a special effect on them such as a one-time Harubang bonus or a cost reduction for cards for the rest of the game. There does not appear to be a limit to the number of cards that you are able to collect on a particular turn when you’ve chosen this action. The game continues until the board is depleted of all Jeju tiles OR the VP card deck is exhausted. Final scoring is pretty simple, you score points as printed on the VP cards collected. Additionally, every two non-wild tiles left in your hand at the end of the game are worth 1 VP. That’s it. If there is a tie, the player with the most VP cards scored breaks ties. 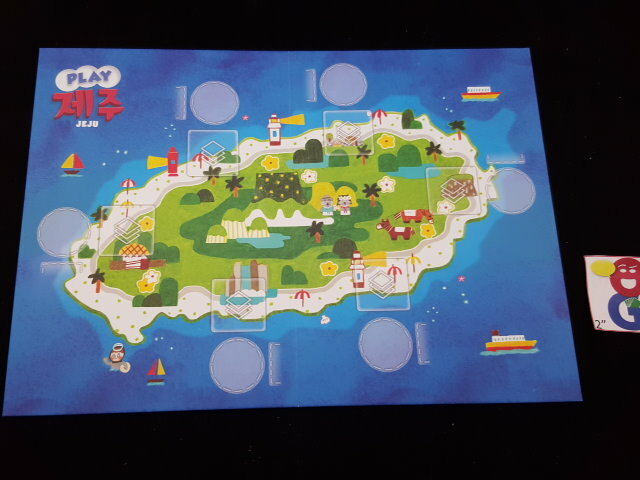 Play Jeju is a very simple logistics-light game. In general, you’ll tend to do well by collecting as many tiles as possible, and your job for most of the game is to get your tokens in position to collect those tiles. 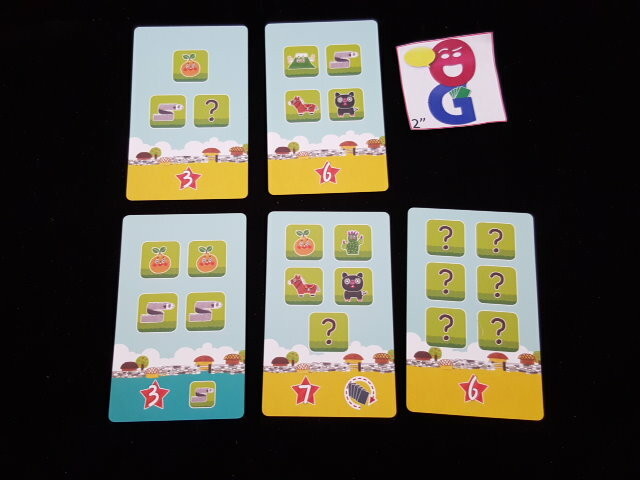 Then, keeping an eye on the point cards, convert those tiles to higher scoring VP cards. One thing to keep in mind is whether you’re going to go for low scoring VP cards which have powerful actions attached to them or if you’re just going to save up for the higher valued VP cards which tend not to have any actions. I have seen both strategies win, so neither seems overpowered. 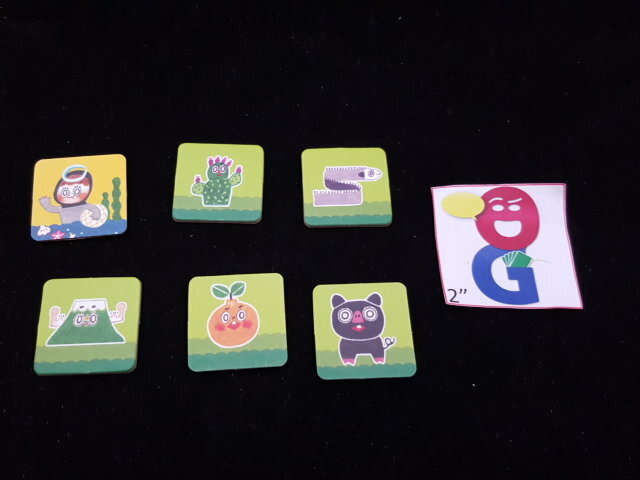 The game does not last very long, and the first couple of times that you play the game, you might be surprised by just how quick the end hits you… We have usually seen the game end due to the Jeju tiles running out. There are only 80 tiles in the game, and this means that at the start, each site will have only 13 or 14 tiles on it. Whenever ANYONE chooses the movement action, this generally means 4 tiles will be distributed on average (to player tokens on top of stacks and nothing given out when a black neutral token is on top or when the site is empty). However, I’d say about half of the time, there is also a Harubang bonus because someone’s colored token is next to the Harubang statue, and this causes an additional Jeju tile to be removed from the board. In my experience, games will probably last fewer than 20 move actions as a result. So, you have to quick when collecting tiles and converting them into points. Ideally, you’d like to wait on a VP card turn until you can collect more than one card – that way, you allow yourself more turns where you control where the tokens go on movement… However, if you wait too long, you might miss the opportunity to collect the card that you want! Furthermore, if you are playing the strategy of getting multiple low scoring cards with bonus actions, you will need to get the early and often in order to use them to best effect.